A man accused of pinning his girlfriend to a sofa by putting his arm across her neck has appeared at court. Lee Jones is also said to have headbutted her, repeatedly punched her and dragged her across a room where she fell on a table. Jones, 30, of Eaves Street, North Shore, pleaded not guilty to assault. The offence is said to have taken place at the home the couple shared in Blackpool on April 5. Prosecutor, Tracy Yates, asked for Jones to be remanded in custody. Defence lawyer, Martin Hillson, asked for bail for his client. 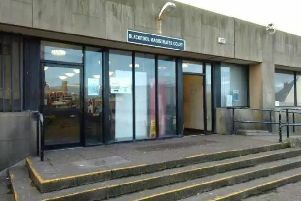 Jones was refused bail and remanded in custody towards his trial on May 31 by District Judge Jane Goodwin sitting at Blackpool Magistrates’ Court. A father accused of breaking a court order by damaging property belonging to his estranged wife has appeared at court. Said Shah, 46, of Saville Road, South Shore, pleaded not guilty to breaching a non-molestation order and denied damaging a door handle belonging to his wife. The offences are alleged to have taken place at an address on Saville Road on March 30. Shad was bailed for trial on July 17 by District Judge Jane Goodwin. A homeless man lost his temper when he was told to move away from a Blackpool clothes shop. Christopher Ashton kicked backwards with his heel cracking a window in the door of Roman Originals, Victoria Street. Ashton, 32, of no fixed address, pleaded guilty to causing damage. He was sentenced to a 12 months community order with up to 30 days rehabilitation to be supervised by the probation service and ordered to pay £200 compensation by District Judge Goodwin. Prosecutor, Tracy Yates, said the owner of Roman Originals saw Ashton kick backwards and break a window at the shop on April 5. When interviewed, Ashton said he had been having mental health difficulties. He had been getting Employment Support Allowance benefit which took into account his mental health issues but following time in custody he became homeless and had to start reapplying for benefit. Ashton said someone inside the shop had knocked on the window and told him to “shift it” and he reacted badly. A man was described as losing the plot when he was sexually propositioned by an older man. Matthew Reeve, 20, of Withnell Road, South Shore, pleaded guilty to threatening behaviour. He was fined £80 with £85 costs and ordered to pay £30 victims’ surcharge. spat on the floor. He refused to calm down and was arrested. Howard Green, defending, said: “He was out and a 40-year-old man sexually propositioned him and he lost the plot. A man accused of damaging the inside of an ambulance with mud during a fracas outside Poulton Golf Club has appeared at court. Christopher McLeod, 59, of The Spinney, Poulton, is also charged with assaulting a woman ambulance worker and a male police officer. The offences are alleged to have taken place on December 19 last year. Defence lawyer. Hugh Pond, asked for an adjournment to make further enquiries into the case which was agreed to by Blackpool magistrates. A man who begged a judge to send him to prison had his wish granted.District Judge Jane Goodwin put Richard Henderson behind bars for two months. She told Henderson , 44, of Park Road,Blackpool:”It is a sad state of affairs that you stand before me begging me to send you to jail.” Henderson admitted going equipped for theft and vehicle inference at the town’s Chapel Street car park.